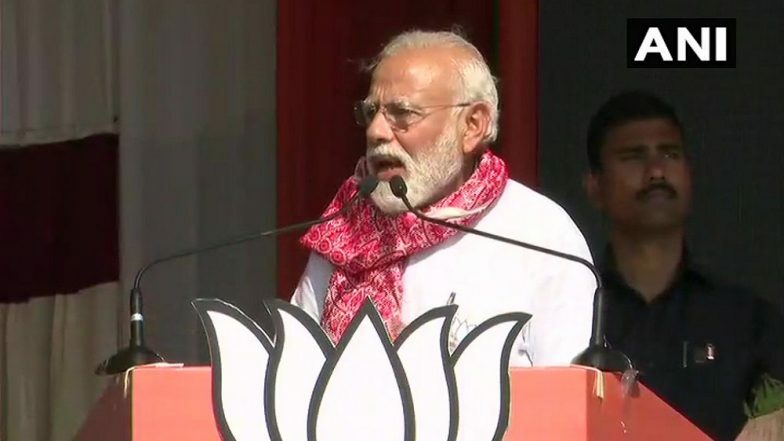 Silchar, April 11: Shortly before the phase 1 of Lok Sabha elections 2019 concluded, Prime Minister Narendra Modi, while addressing a BJP rally in Assam's Silchar, said the country is gripped with a "Modi government wave". His remarks came amid a contest for 91 parliamentary constituencies, spread across 18 states and 2 union territories. "Which way the electoral mood is swinging is already evident. I am sensing a strong wave in favour of Modi government across the nation. The people of Silchar have proved it," he said. Nearly 60% Voter Turnout Recorded in Uttar Pradesh Till 5 PM. "Today, voting is taking place in the first phase in some parts of the country. From what we know so far, a zabardast (strong) wave for 'phir ek baar Modi sarkar (Modi government again)' is visible," the PM was further reported as saying. Modi trained his guns at the Congress, targeting the erstwhile government in Assam and at the Centre of playing "vote bank politics". The policy of appeasement, Modi said, was responsible for the lack of development and misgovernance in the region. In Assam, voting was today held in 5 of the 14 parliamentary constituencies. In neighbouring West Bengal, two constituencies were contested. The maximum seats in polling fray were from Andhra Pradesh (25) and Telangana (17), followed by Uttar pradesh (8), Uttarakhand (5), Odisha (4), Maharashtra (7) and Meghalaya (2). In Manipur, Mizoram, Sikkim, Tripura, Lakshadweep and Andaman & Nicobar, 1 constituency each went to polls.